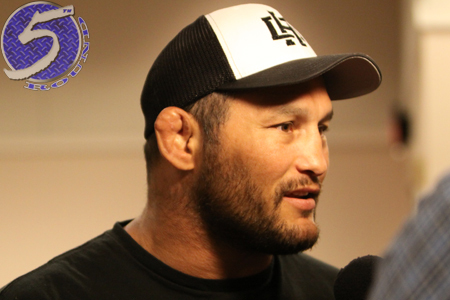 On Wednesday’s edition of ESPN’s “SportsCenter,” UFC president Dana White announced a light heavyweight shootout between Dan Henderson (pictured) and Daniel Cormier will co-headline UFC 173. White added that the winner of the tango will get next crack at the 205-pound crown after top contender Alexander Gustafsson. Gustafsson meets the victor of Saturday’s UFC 172 scrap with champ Jon Jones and Glover Teixeira. Cormier successfully made his light heavyweight debut in February by quickly disposing of Patrick Cummins at UFC 170. The 35-year-old will now test his skills against someone with a similar arsenal – a wrestler-turned slugger. Henderson is just one month removed from his dramatic come-from-behind TKO victory over Mauricio “Shogun” Rua. It was a much-needed win for Hendo, as he had dropped his prior three bouts before beating the Brazilian for the second time. The May 24 event takes place inside MGM Grand Garden Arena in Las Vegas, Nevada. A bantamweight title tilt between champion Renan Barao and T.J. Dillashaw headlines the pay-per-view broadcast.